Broughton Church roof has recently been alarmed at a total cost of £5,600, with the aid of a grant of £2,500 from Cambridgeshire Historic Churches Trust (CamHCT). The grant was made possible by funding from the Allchurches Trust Ltd.
CamHCT offers grants and loans to help congregations look after their historic places of worship. Its main source of income is the annual “Ride, Drive and Stride”. Each September sponsored cyclists, motorists and walkers visit churches, chapels, and colleges throughout Cambridgeshire, sharing the money raised between the Trust and their local church. The purpose of the alarm is to help deter thieves from stealing the lead on the roof. This is not only an issue in terms of the loss of the lead itself, but also all the damage done to the structure whilst it is being removed, and the subsequent damage done as a result of the building no longer being water tight. Sensors have been placed on the roof which if activated will trigger an alarm and flashing light and automatically inform a remote security monitoring organisation, who will immediately inform the PCC. If anybody would like to know any more about the new roof alarm or would like to make a specific donation to church funds to cover the shortfall between the cost and the grant, please contact the rector or any member of the PCC. 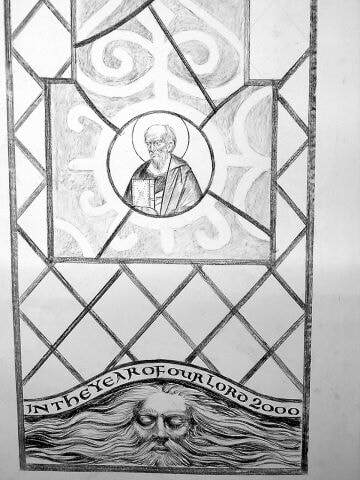 On 7th February 2001 a Consistory Court was held in the church to decide how and where a proposed Millennium Window should be installed. The following are some of the papers to do with this hearing, which was presided over by Judge Sir William Gage, who, a few months later, presided over the trial of Jill Dando's murderer. I am Rosemary Jane Logan, currently the Secretary of the Diocesan Advisory Committee, a position I have held since February 1999. This church is Listed Grade II* and is of limestone rubble and pebble construction with plain tiles to the roofs. The west tower is of three stages with angle buttresses, moulded plinth with a broach spire with two tiers of four spire lights of two and one trefoil light with gable tracery. The north and south arcades are of four bays circa 1300 with two centred arches with moulded labels and headstops. The piers are of octagonal columns. The nave roof, which is largely modern, has carved figures of angels of about 1500. There is a Doom painting over the chancel arch and a painting showing the expulsion of Adam and Eve on the south nave wall and other fragments elsewhere. The pews are possibly sixteenth century, the communion table in the south aisle is eighteenth century and it is thought the south aisle window has a small piece of early sixteenth century glass. 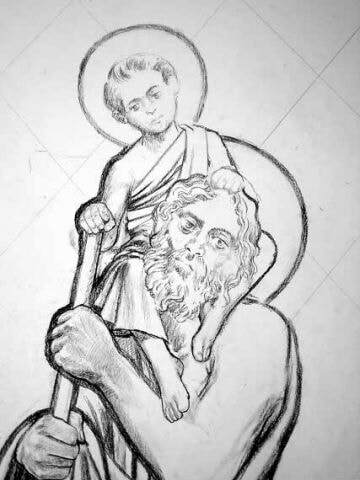 The proposal is to install in the western most window of the south aisle a new stained glass window designed by Dean Cullum, representing St Christopher with the Christ Child on his shoulder. “Members present had no objection in principle to installing a stained glass window, but were not supportive of the design submitted”. “Members present agreed to recommend in principle a stained glass window as proposed. I enclose a copy of the report of the Sub-Committee visit for your information and would particularly draw your attention to the final paragraph. 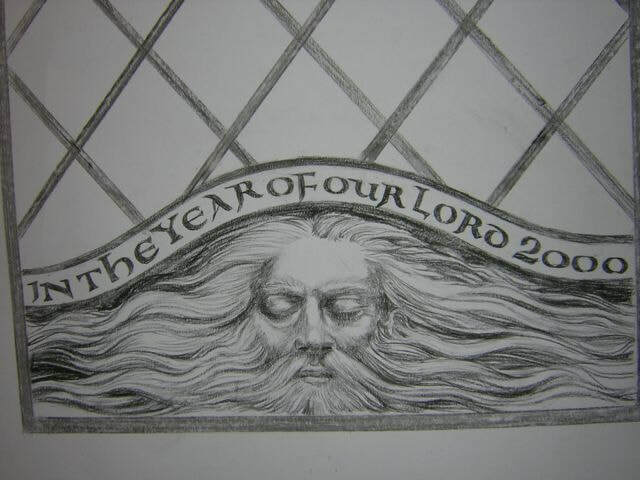 I therefore wait to receive a detail of part of the window as actual size, and the type of glass which is to be used”. Also available at the meeting in October was an improved computer derived copy of the artists sketch design, provided by Mr Hague. “This matter had been discussed by the Committee at its meeting on 8th October, when members present agreed to recommend in principle the stained glass window as proposed. A detail of part of the window’s actual size and the type of glass to be used had subsequently been provided. 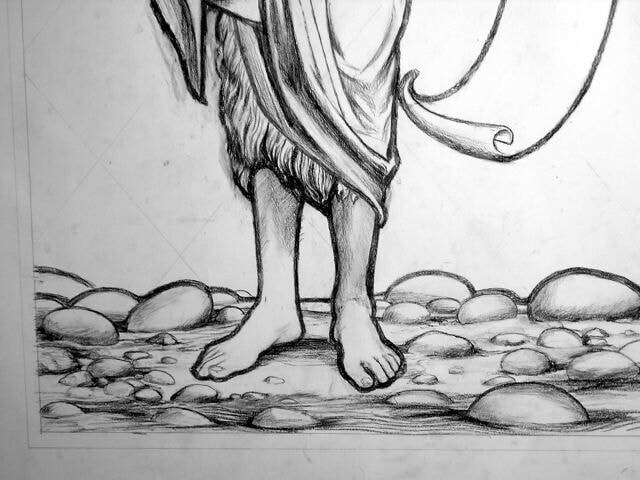 Recommended; the drawing detail provided did not indicate the actual width of the leading, and this was crucial. Care needed to be taken with this aspect”. Subsequent to that meeting I issued the necessary papers for the parish to petition formally for the faculty. I enclose for additional information a copy of the report of the DAC Sub-Committee visit to Broughton on 31st August 1999 and a copy of the Certificate of Advice issued following the meeting of the Diocesan Advisory Committee on 10th December 1999. Note: Mr John Ray, who is referred to above was a churchwarden and Mr Peter Hague was secretary of the PCC. Present : representatives of Broughton PCC, Messrs Baggs, and Hartridge, the Rev. Canon J. 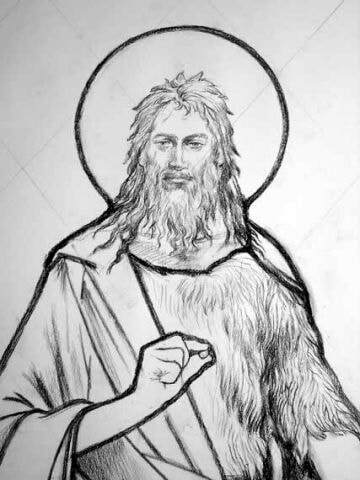 Young, the Archdeacon of Huntingdon. Apologies from Mr W Sanders and Ms Jane Logan. 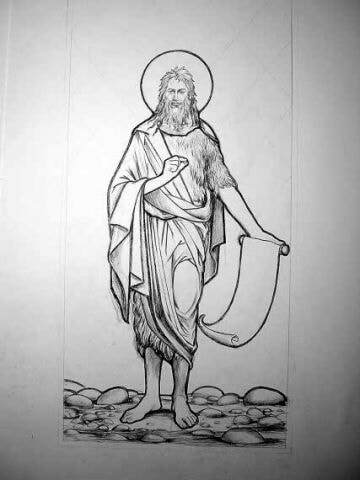 1) the water in which the apostle is standing could be defined more clearly so that the feet are shown to be under the water, and the water itself should extend fully across the three panels at the window’s base. 3) the quarries in the three panels of the lower part of the window, which was restored some ten years, are at a different angle from those at the very top, and an opportunity could be taken when the new window is made to make these consistent. 4) Jonathan Young asked the parish to consider whether the tower area might ever be developed as a coffee-making or toilet facility, with a new ringing chamber above, since this would compromise the effect of the new window, but the parish representatives thought that this was most unlikely. The Archdeacon explained the next stage of the proposals, and advised that following the next DAC meeting and a letter from the Secretary, the parish would need to be in touch with the heritage bodies. 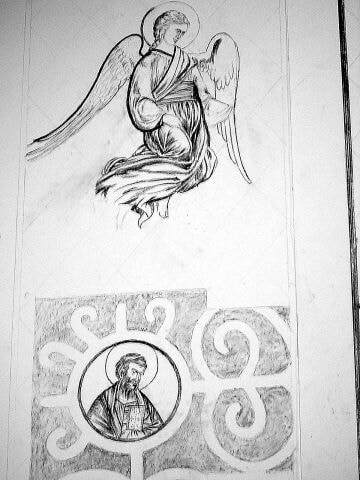 Dear John Beer, the attachment is of the cartoons for Broughton Church, nr Huntingdon, for which I am making a window. I hope they are of sufficient quality to see clearly; it is the first time I have sent digital photographs by email and so I can't guarantee the results. I have good photocopies of them, though, if these are not good. 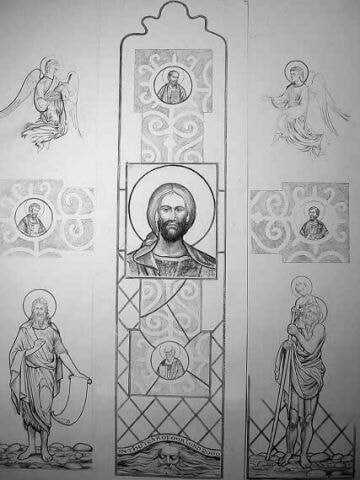 I presented a folio of the designs to the parish just before Christmas and they have not responded yet. If you, or any other members of the DAC have any questions or comments, they would be gratefully received. 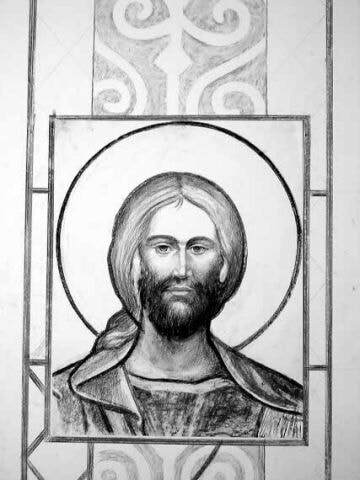 Both John Ray (the churchwarden) and I felt that it was important to show the designs to the DAC at this stage as it is now easier to see how things will look in the finished window than from the scale drawing that you originally saw. The lead lines on the figures and foreground have now been drawn-in but I don't think they change anything much and hope you will think that they are sympathetic to the existing drawing - much of which! had the lead line in mind during its working-out. 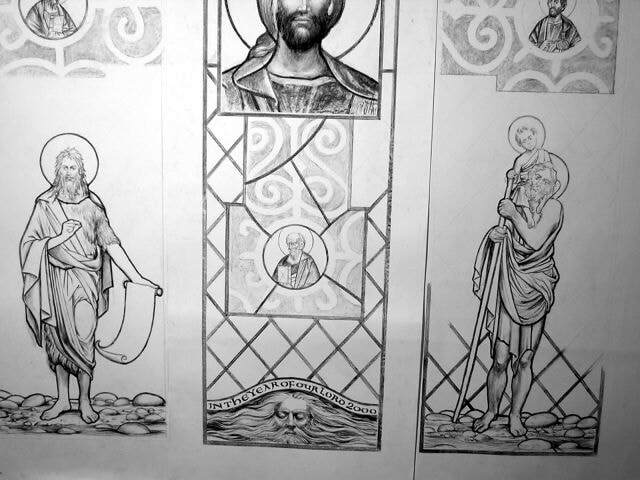 I am about to start on the preparation of the cut-line drawing, the glass easel and the glass selection and cutting as well as finalising a few areas of the drawing. This will all take a few weeks and will hopefully allow time for you to respond if necessary to the cartoons.